This recipe comes from Peppel's friend Véronique. If you don't have the time to make the dish all at once, sauté the ingredients and keep the entire dish cooking over low heat overnight (about 12 hours). Place the neck and organs (if you have them) along with the garlic and bouquet garni in a cheesecloth sack. Tie off the sack with kitchen twine. In a large, heavy-bottomed stockpot, melt the butter and brown the rooster pieces. Add the bacon and onions and cook for 5 to 10 minutes. Add the tomato, carrot, and mushrooms. Sauté over medium heat for 5 to 7 minutes. Add the flour and stir with a wooden spoon for another 5 minutes. Then add the Cognac, wine, and blood if you have it, continually stirring. Add the cheesecloth sack, then cover and let simmer for 45 minutes. Remove the cheesecloth sack and discard. Also remove the rooster pieces and bacon, but keep covered on a plate to preserve warmth. If you feel like it, pass the remaining sauce through a strainer to remove the bits of cooked vegetable. Return the sauce to the pot and bring to a boil. Once the sauce has reached a boil, reduce the heat to a simmer and stir until thickened. 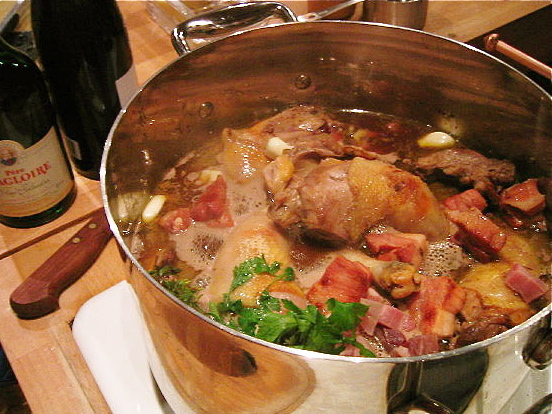 Then return the rooster pieces and bacon to the pot, and thoroughly heat until the flavors are well blended. Adjust the seasonings with salt and pepper, and serve warm with slices of fresh crusty baguette.